A letter from George B. Agnew to Isaac Vanderpool, dated May 21, 1895. On behalf of the National Produce Company as its secretary and treasurer, Agnew offers a business deal with Vanderpool in regards to the purchase of Florida fruits and vegetables for the wholesale market. The National Produce Co. was a produce wholesaler based at 635 Liberty Street in Pittsburgh, Pennsylvania. Original 1-page letter from George B. Agnew to Isaac Vanderpool, May 21, 1895: Vanderpool Collection, accession number 2014.002.014V, room 2, case 2, shelf 10, box GV, Maitland Historical Museum, Art & History Museums - Maitland, Maitland, Florida. Digital reproduction of original 1-page letter from George B. Agnew to Isaac Vanderpool, May 21, 1895. Vanderpool Collection, room 2, case 2, shelf 10, box GV, Maitland Historical Museum, Art & History Museums - Maitland, Maitland, Florida. Originally created by George B. Agnew. 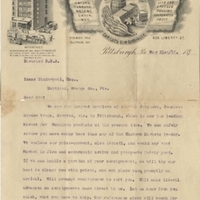 Agnew, George B.. “Letter from George B. Agnew to Isaac Vanderpool (May 21, 1895).” RICHES of Central Florida accessed April 24, 2019, https://richesmi.cah.ucf.edu/omeka/items/show/4187.